Every fortnight we wander blindly through the classifieds in our deals section in an effort to find you something special, whether it’s a one off, a bargain, or something absolutely awful. And with this week’s theme being bangers, you can expect them to be mostly awful. This week our maximum budget is £800, and for that amount it’s unlikely we’ll be able to find anything completely trouble free. The best chance of reliability comes with our first find, a 2000 V-plate Nissan Micra. It might not have the image of its European counterparts but a sturdily built chain cam 16v engine means it’s almost certainly going to outlast them. Available as 1.0- and a 1.3-litre it’s revvy, reasonable on fuel and relatively inexpensive to tax. The mileage is at just over 100,000 miles, which is about right for the age. The metalwork is fairly thin and prone to dents, something demonstrated wonderfully by this example, which has a substantial bump in its hatchback door. There’s very little in the way of gadgetry, the windows are manually operated, and it’s got steel wheels. It does have power steering, on the plus side. But it’s not that expensive to run, it’s cheap to fix and it’s not that bad to drive. Yours for £595. It’s not to all tastes, though. So if you want something that feels a little more retro, there’s always this Peugeot 205. 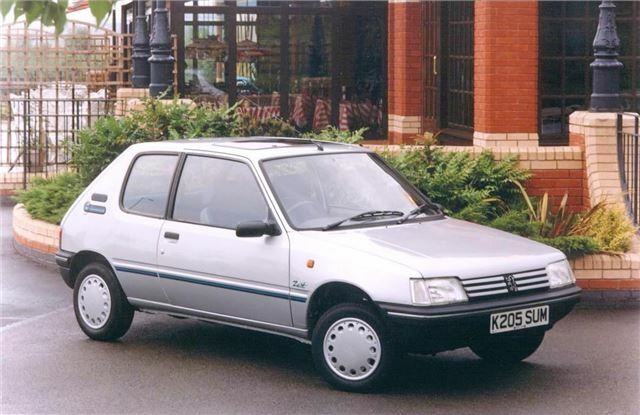 For the same price as the little Nissan you could be clunking around in a 1990 G-reg Peugeot 205 1.1 GL, a car renowned for its fun handling when it was new. This one’s got a full service history and 12 months MOT. It falls into the same insurance category as the Micra too, so in theory it shouldn’t be that expensive to run. Unless of course it goes wrong, and any 20-year-old car is going to have some problems lurking somewhere. It’s a gamble, this one, but for its nostalgic value alone it is certainly a worthy banger. Size does matter though, at least to some buyers. But even if you’re on a budget you can still find big cars in your price range. Like an 80,000 mile mid 90s BMW 520i. Complete with leather, air conditioning, an automatic gearbox, electric windows and mirrors, alloy wheels and remote central locking, this big executive machine was boss of the company car park when it was young. Now it’s just a big thirsty car. But irrespective of that fact, many will still find it a desirable proposal. Judging by the photographs this one looks fairly straight. But this was an expensive car when it was new, so any repairs that are needed now will be difficult and probably expensive. If you’re handy with the spanners and you don’t mind steep fuel and VED bills, then this 520i can be yours for £690. Lastly, if you’re looking for something that falls beyond the category of large and edges into behemoth territory, our final banger might be up your street. A 1998 R-plate Volvo 940. With its enormous load space the 940 is ideal for visits to the tip or escapades to garden centres. This example has a 2.4-litre petrol engine boosted by a low pressure turbo, as well as half leather interior and alloy wheels. The advert isn’t hugely detailed, but the word MOT does appear, which is always a bonus, although the mileage figure being unlisted points at it having covered a similar distance to the USS Enterprise. It’s for sale at £695. Buying a banger is always a gamble. Sometimes you’ll get a perfectly reliable day-to-day runabout, other times you’ll end up with a nightmare. But on the bright side there’s never going to be a huge amount of depreciation, and there’s plenty of choice. Whether you’re looking for a battered old shed or a brand new car, there’s bound to be something suitable in our classified and deals section.